Winings applies years of experience as a communicator to her passion for space at Griffith Observatory. Bonnie Winings, (SOC/MA '76), built her skillset in American University's Public Communication MA program and launched a successful communication career at PBS in Washington, DC. Later, her talent propelled her across the country to California, where she spent three decades working in entertainment public relations. Winings is now Director of Development and Communications for Griffith Observatory in Los Angeles, where she has had a busy summer juggling press inquiries about the August 21 total solar eclipse. "Having worked in Hollywood and entertainment for 30 plus years, as far as I'm concerned, the real stars are at Griffith Observatory," says Winings. "There are so many exciting stories tied to space missions right now, from exo-planets to the James Webb Telescope launch." Before getting her master's, Winings had interned at a PBS station in Cincinnati. While she attended American University, she was provided with several more internship opportunities that helped her discover what she wanted to do while giving her corporate, institutional, and academic experience. "The skills I gained, especially long-term planning, paid off in the rest of my career." After graduation, she took a job with PBS in Washington, D.C., and her connections there would prove useful as she and her husband moved to Los Angeles. "AU taught me about networking," says Winings. "That networking connection -- meeting people, talking, and finding the next best person to talk to about your field -- is invaluable," she says. During her transition to California, Winings kept in touch with the people she knew at PBS and also connected with PBS member stations in LA. She was able to leverage her connections to find a position at independent public television station KCET in 1980. It was by chance that Griffith Observatory came onto her radar, when they reached out to the station for help doing a membership promotion. The work she did for the Observatory was, at first, on a volunteer basis, because she had a passion for astronomy. She spent a few more years working in the entertainment industry, from launching commercial television series to cable networks. However, as time progressed, she started looking for a new challenge. Because of her connection with the Observatory, when they sought a Director of Development, Winings seized the opportunity. 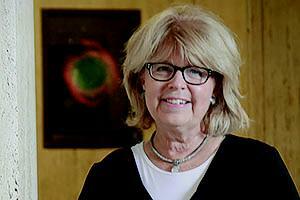 She explains, "Working at Griffith Observatory is like coming full circle to an original passion. I've been able to bring all my professional and educational skills into what I'm doing." "I wanted to become an astronomer as a ten-year-old," she says. "One evening, deep in the woods, at a Michigan camp, I looked through a small telescope and saw Saturn, and I was mesmerized. It was just a transcendent kind of moment. I brought that natural enthusiasm and my fundraising and promotional skills together at the Observatory and feel like I'm making a real contribution."